The 2nd annual Chalk It Up! competition was held on Canal Street in New Smyrna Beach on Saturday, February 23,2019. The event, sponsored by The Hub on Canal, the City of New Smyrna Beach and the Canal Street Historic District, was held in conjunction with the 57th Annual Art Fiesta! art show. More than 80 artists of all ages participated in the event, creating artistic images on 4×4’ spaces on the sidewalk in front of local Canal Street businesses. Thousands of visitors strolled the street to view the beautiful chalk art creations. 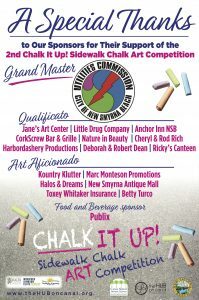 The sidewalk chalk art competition was free to all participants, with monetary awards, prizes , or trophies given for all categories. Levels of competition included Adult Professional, Adult Amateur, Family Group, High School, Middle School, Elementary School and Business. Individuals or groups participated in a variety of categories including original, photograph, masterpiece or conservation. Sponsored by the Utilities Commission of New Smyrna Beach, the conservation category represented a nod to the city’s commitment to sustainability and conservation. A separate category supported local businesses who competed for the honor of receiving the Best of Show Traveling Trophy. Click HERE to view many of the beautiful images created as part of this special event. On behalf of The Hub on Canal, we congratulate the winners and thank all of the many sponsors, participants, and visitors for their support of this amazing event! For more information on the sponsors for the event, click HERE.